Selma Blair,Eva Mendes,Ashley Olsen,Gwen Stefany! 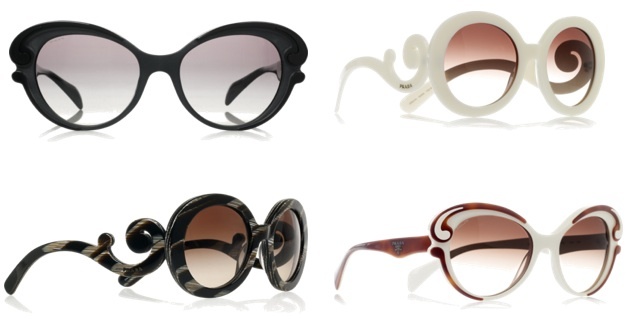 It seems our fav celebs are in love with these new Prada shades called Baroque! And I can definitely see why! These swirly sides are just Ah-dorable! These shades are so classy! They take me back to old times.I don't know why but just by looking at then I'm seeing old castle doors etc These vintage arms make them so unique! They are here to make a statment! And because not everyone can afford these fabulous but really pricy Prada babies,(here comes the good news) you can find really similar ones at this site : http://www.romwe.com/?gclid=CPvfuZTxlrECFVE8fAodPHCDhA ! So If you do have the money spend it well at those fantastic sunglasses! But If you don't just try buying the similar ones! Because as I always say It's not what you wear.. But it's HOW you wear it! (and I can assure you even some hot page lookbookers have tryed the romwe ones! So be bold! Make this statement!